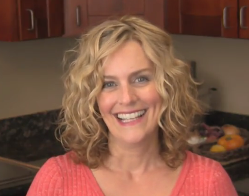 You're Going To Love Our Online Vegan Cooking Classes! "Since getting plugged into Vegan Coach's classes, I now eat, cook and prepare delicious food with out-of-this-world flavor." Learn how to be vegan with our helpful online vegan cooking classes and helpful eBooks! We'll show you how to cook, balance your meals, lose weight, stock your kitchen, and more -- all with plant-based whole foods! 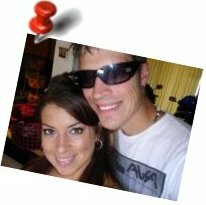 All of our vegan courses are based on the same "rules of the vegan road" that we've taught since we started VeganCoach.com back in February of 2007. We want to help you break through the boundaries you've likely grown up with, where everything about food and cooking is so strict including grocery shopping, cooking, even how you stock and manage your kitchen! Because my friend, there IS an easier way! Being Vegan doesn't have to be difficult. It can be fun! And we'll be here for you every step of the way. p.s. If you have any questions about any of our eCourses or eBooks, please let me know via our Contact form or in the Facebook comments below. Or, if you'd like to speak with a real, live person you can click here to Chat w/the Coach. Sign up for an available 20-minute time slot, and I'll give you a call to match one of our courses to your vegan skill level. Thanks! Scroll to see the Special Deals we've put together for you on our online vegan cooking classes (beginners to advanced), menu planning, weight loss and more! Vegan Cooking Classes: Get Down With Sass! Get Down With Sass! Going strong since 2008! This online class is continually updated to reflect the most-recent changes to the best of whole food plant-based nutrient needs that encourage weight loss. I'll show you step-by-step how to shed those excess pounds and, perhaps more importantly, how to maintain -- for life! Learn the steps to lose weight naturally and keep it off for good as you discover how to create a healthy well-balanced vegan diet that also promotes weight loss that works for the long term. You'll get a fresh, new idea of the food on your plate while you kick stress and confusion to the curb. 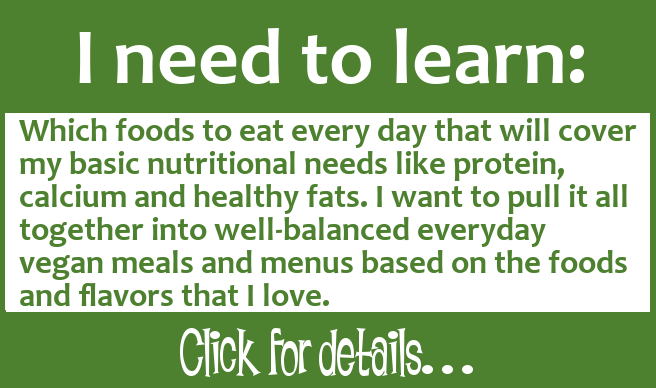 Learn exactly WHAT to eat and WHY as you make important changes to your lifestyle that will support you for years to come. This is the perfect course for you if you have weight to lose and it's incredibly helpful to new Vegans. And if you're a "well-seasoned" Vegan and you can't seem to lose weight, this course will help you uncover what's going on and what's standing in your way. You'll also learn all about which ingredients and foods make up a healthy vegan weight-loss promoting diet as well as what you need nutritionally to create balance with every meal. Click here to learn more about Get Down With Sass! 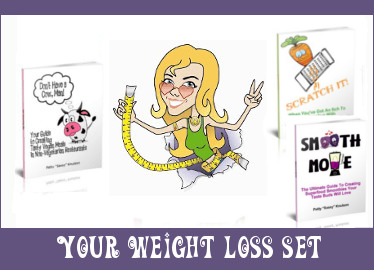 "Your weight loss course Get Down With Sass! should be required for every person who wants to lose weight. It's a clear, easy, and gradual way to change your lifestyle to be health-focused. I believe your program extends far beyond a weight loss program into a holistic lifestyle. That makes it sound intimidating, but the way it's introduced makes it simple and gradual enough that anyone can adapt quickly." "Everyone who is on a diet should stop the madness and change their health the right way with this program!" 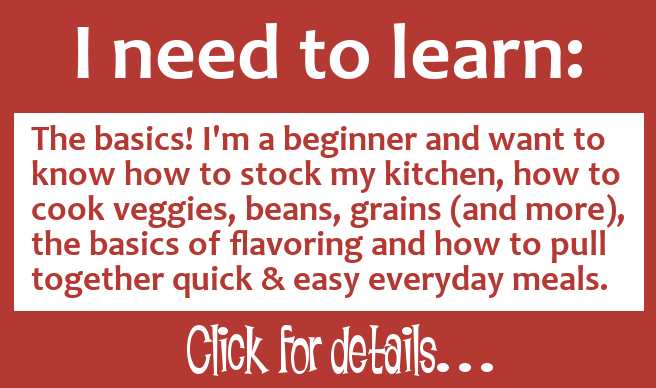 Vegan Cooking Classes: Vegan FUNdamentals! 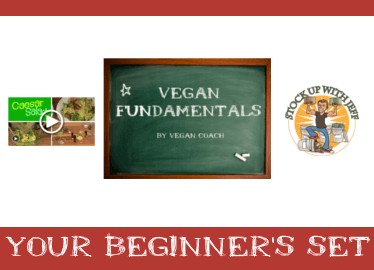 Vegan FUNdamentals! Out of all of our vegan cooking classes, this one was created just for those new to eating a plant-based diet. This 6-week online cooking course teaches you everything you need to know to cook easy whole food plant-based meals. If you're new to cooking plant-based, this is the perfect place for you to start. Because you can't even begin to make a meal if you don't know which individual foods and ingredients to buy — how to shop for them, prep them, cook them and flavor them. Only then can you actually pull them together into tasty meals that are not only quick and easy but filled with the nutrition that you need. On-the-fly FREESTYLE cooking is what we've always taught in all of our courses and across our entire VeganCoach.com website. And this cooking course is devoted to laying the very foundation you need in order to pull it off day in and day out. Because once you get the basics under your belt, you can apply them to absolutely every dish you make -- whether you use recipes, or not! Bonus #1: Raw Veggies and Salads Videos with some of our all-time favorite salads that are tasty AND nutritious — you're going to LOVE these salads and NEVER get tired of them! 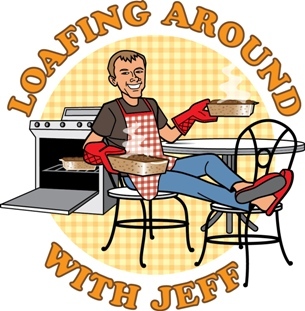 Bonus #2: "Stock Up With Jeff" in this handy eBook you'll learn the important skill of stocking up with bulk ingredients PLUS how to keep them organized, in rotation, and how to keep track of it all so your food stays fresh and ready to go when you need it. Perfect for establishing an emergency food supply, too! (including student testimonials, course curriculum and more)! 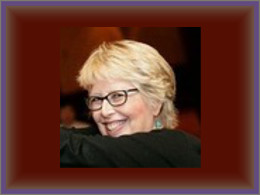 "I made the decision to move to a plant-based diet but this required that I learn how to prepare and cook plant-based. This course has helped me do that. Now I shop the Sassy way: Find the fruits and veggies that are available and then make meals without a lot of recipe action. I loved this course and the videos were so helpful. I have told a number of friends about it!" Vegan Cooking Classes: Get Sauced With Sass! Get Sauced With Sass! This is one of our online vegan cooking classes designed to teach you one-of-a-kind vegan saucemaking! You'll learn to create nutritious and yummy sauces from scratch without a recipe in sight! They make each and every meal special and unique. Get Sauced! helps you free yourself from the bonds of recipes. You can develop your very own tasty sauce at any time and with any ingredients you have on hand. Sauces can be ready in minutes, because delicious and nutritious doesn't have to mean time-consuming! With GSWS, there is simply no huge time commitment to get yummy meals on the table. In fact, you can make a saucy meal tonight! Get started right away. The techniques are laid out so simply, that you can implement them immediately. Bonus Video: "How To Make Rejuvelac" with its own dedicated forum so you can ask any questions about the process. We'll all be there with you every step of the way! Personal coaching right in the course! Your questions will always be answered in a timely manner. 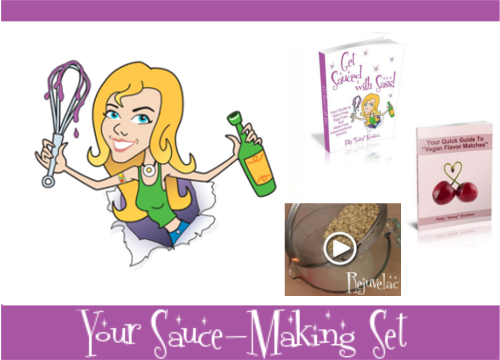 Click to learn more about Get Sauced With Sass! "I want to send my thanks for the Get Sauced with Sass! course. It really helped me out in making not just my sauces, but all my cooking in general, taste much better!" "I love the Flavor Matches and use them often." This is one of our online vegan cooking classes that teach you how to make delicious and satisfying meatless Veggie Loaves from scratch without a recipe. When you learn to cook recipe-free no-meat Veggie Loaves you can skip a day of cooking plus have delicious lunches ready to go (or store and freeze for a later date), find a use for all those odds and ends hanging around your fridge (no more waste! ), and feel comfort knowing you've created a filling and nutritious meal based on the flavors you (and your family) love that you can all agree on. This course will instruct you step by step into how to create your very own tasty and nutritious Veggie Loaves using simple tips and techniques that you'll not only find easy but that you'll enjoy because you'll tap into your own creativity in the process. Loafing Around helps you create fresh new dinners every single time. You'll own the course and can revisit the videos, lessons and forums PLUS retake the course at any time. "Made my first two loaves yesterday! I just watched the third installment in the series and I can't wait to make more! I really don't know why it's so much fun. Maybe it was being up to my forearms mixing while my son added the seasonings I called for. Then seeing the fruits of your labor. This course has made me realize I had gotten into a rut, no longer creative with my cooking. Same ol' same ol'. My inspiration has been restored!" 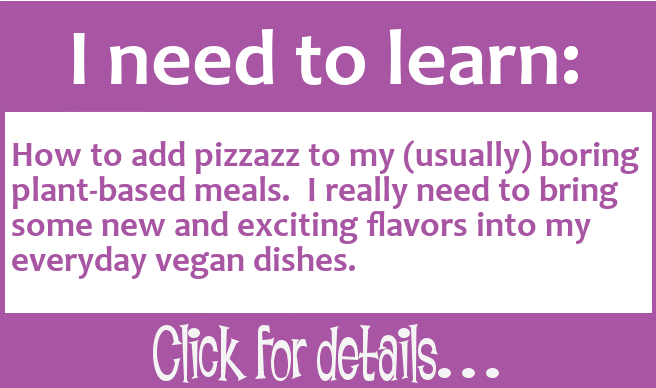 Vegan Cooking Classes: Plan It With Sass! Plan It With Sass! This is the first vegan menu planning course of its kind. We'll show you how to get a fresh idea of the food on your plate! Learn to plan your vegan meals so you can choose the foods you love that also support you nutritionally as you learn about the vegan food groups as well as figuring out your unique protein/calcium/healthy fats needs and how to create a daily menu that delivers the nutrients you need every day. Plan It! teaches you step by step how to plan well-balanced, healthy, nutritious, and tasty meals that you (and your family) will love. Join me as we take a walk through the information-packed Lessons filled with the best of advice about vegan cooking and nutrition that will get you in and out of the kitchen in record time. 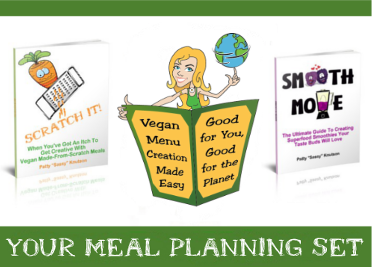 You will learn how to build vegan menus that you can use for the rest of your life. Click to learn more about Plan It With Sass! "I loved your menu planning course Plan It With Sass! I have been vegan for a couple of years but I still learned a lot from this book. It has helped me, in a short time, make some changes that I can already feel are affecting me in a positive way. I am ready to stock my cupboards and start planning meals!" Vegan Cooking Classes: Cooking With Sass! Welcome to Cooking With Sass! This is our flagship course, and one of our most comprehensive online vegan cooking classes. We open registration to this class three times per year, based on the season! You'll love this freestyle cooking course where I'll teach you how to step into your kitchen, see what's on hand, and get cookin' without a recipe in sight! It's important to learn the skills to mastering freestyle cooking. Not only does this save you time (for example, painstakingly measuring out the exact ingredients a recipe calls for) but it saves you money too! How? Because you'll choose ingredients that are in season and at their freshest while priced less than ingredients out of season. PLUS, when you cook without recipes you use the nutritious food you have on hand instead of tossing old and wilted veggies into the garbage -- sheesh, the money you'll save on this alone is likely substantial! 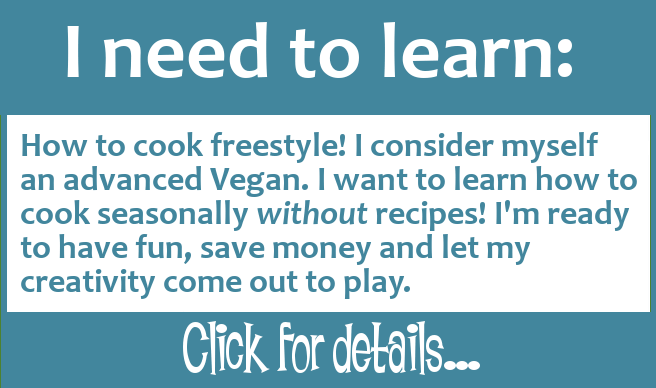 Learn the skills to mastering vegan recipe-free cooking in this Freestyle Cooking Series: Three 12-week online classes covering Spring/Summer, Autumn and Winter seasons! Want to learn more about the class? 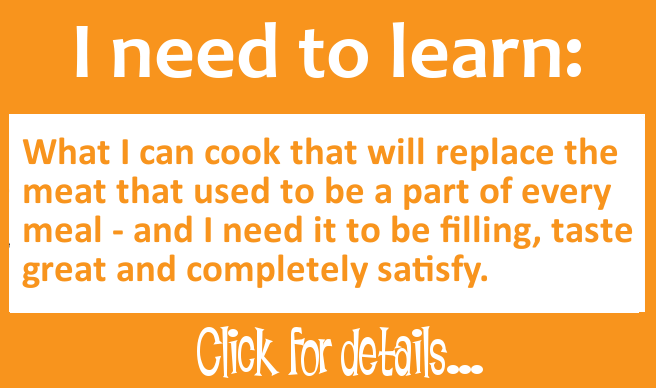 Click the link below to see the curriculum, read student Before and Afters and comments about their experience with the class, see an example cooking demo and more! 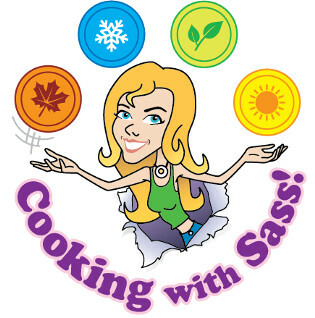 Click to learn more about Cooking With Sass! "Do you want to know something that I feel is unusual in taking this class? Well, I EXPECTED to have to go out and purchase different ingredients to make all the things you would have us make, right? Never one time have I purchased ANYTHING for this class! NOT.ONE.THING! So, I guess that means that anyone can benefit from these classes because it truly is teaching us to use what we have on hand already! In fact, I have only been shopping 3 times since these started and only bought staples! Way less than usual! I thank you for this! Glen thanks you for this! Recipe-free! XO"
"This is exactly the approach I best relate to. 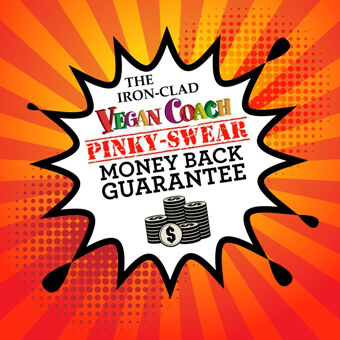 I've purchased several of the Vegan Coach programs, all of which are helpful, inspiring and informative. The highlights of those courses, for me, are the video segments where you can see what exactly is happening in the kitchen and how a meal goes together. I also like seeing the amounts of flavoring ingredients that are used in a dish - not to copy them necessarily, but to get a sense of how you approach it." IF YOU DON'T WALK AWAY FROM ANY CLASS WE OFFER FEELING SATISFIED AND EXCITED ABOUT YOUR NEW SKILLS, THE COURSE IS FREE. If you'd like, we'll even hop on the phone with you for a free 1-on-1 private coaching session just to be sure you're getting the results. Why would we do this? Because when you team up with us, you join our ever-growing Vegan Coach family. We truly care about you! Thanks so much for checking out our vegan courses. Be sure to check back occasionally as we have more courses planned to help you be the healthiest and happiest vegan you can be. p.s. Remember, if you have any questions about any of our eCourses please let us know via our Contact form. 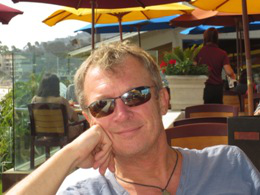 Q: I am considering taking one of your courses and wondered if it is adaptable to vegetarian (with eggs/dairy)? A: All of our courses are perfect for any level of vegan, vegetarian, or non-vegan. We simply teach you the vegan end of things and you can take it as far as you want to. For instance, let's take Plan It With Sass! or Get Down With Sass! 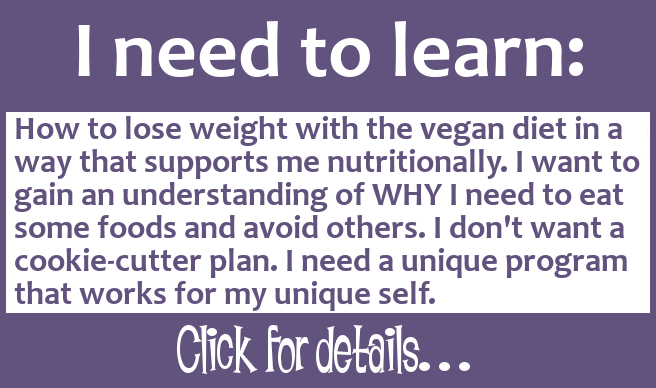 By the end of the course you have learned all you need to know to eat a well-balanced vegan diet so you're covered if you want to release the animal products, but you certainly don't have to. It's not a requirement. Please let me know if you have any further questions about any specific course in the Facebook comments area below. Thank you! "You are quality all over! Your courses are super quality! You really rise above the norm. So glad I found you!" 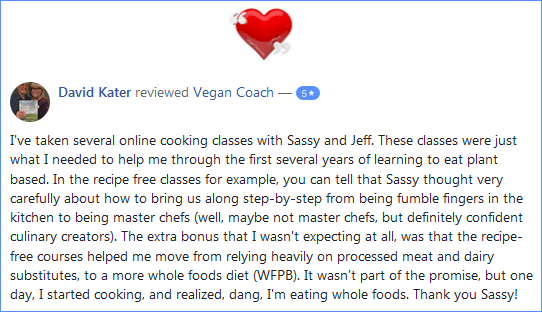 "Love the Vegan Coach, and Sassy and Jeff are amazing at providing the necessary information and guidance to help you on your way to eating healthier and making the switch to a vegan lifestyle. Great courses!" "I just wanted to say thank you. Your website, eBooks, and tutorials have made a huge impact in my life. Late last year I chose to become vegan, but was lost in how to prepare meals and maintain proper nutrition levels. I randomly stumbled upon your website and it has become one of my favorites. I appreciate all that you and your husband have done in educating and helping vegans." "Prior to working with the Vegan Coach, I was an unhealthy, overweight, junk-food vegan that had no clue and had no idea where to start with what is truly a HEALTHY diet. I rarely cooked, and always the same boring things. "Since getting plugged into Vegan Coach's classes, I now eat, cook and prepare delicious food with out-of-this-world flavor that my non-veg friends and family (and even my non-vegan husband Tyler) actually request! "It has all been simple and easy to understand. I now know what it means to eat HEALTHY and have all tools I need, and the peace of mind that goes with it. If you have not started into their training and services, do it. Now! You and your health cannot afford not to."